CENTENNIAL, Colo. – There is something beautiful and majestic about a horse, from its raw power to its sheer beauty in movement. Russell Beatty first witnessed it as a child, and that’s when his passion for horses began to stir. It’s merged into a lifelong love and a hunger to work with horses. You see, Beatty has worked with and trained horses all his life, and now he has developed the Colt Starting Challenge USA, an event that features some of the brightest trainers in the country who work with untrained horses in a competition. The trainers will then work with the animals over the course of two two-hour sessions set up over two days, and judges will determine which of the trainers wins. The competitions will take place across the country, including an event scheduled for 9 a.m. Friday, Aug. 1, and 10 a.m. Saturday, Aug. 2, at the Montezuma County Fairgrounds in Cortez. “We will have two hours of work the first day with a half-hour break in between,” Beatty said. “This is all done with an audience, and each contestant has a microphone so that when it’s their time to talk, they can say what they’re doing and why they’re doing it. The contestants love the idea. It also allows trainers to show their stuff and promote the work they do. That’s a valuable tool, especially for horse owners that are looking for someone who can work with well with their animals. It’s that type of progress that makes the Colt Starting Challenges a draw not only for competitors but also for horse-loving fans who come to see the trainers at work. They can take some of the lessons they learn inside the arena back home or consider utilizing one of the trainers with their animals. The shows are set up in a fan-friendly environment that makes each performance enlightening. It’s a pretty good feature for Beatty, who began the idea on the islands a few years ago. Beatty was raised near San Antonio in the community of Helotes, Texas. He competed in rodeo and attended college in Sheridan, Wyo., on a rodeo scholarship, where he studied ranch management. He continued to compete in rodeo – riding bulls and saddle broncs and roping calves – until he was 42. If there’s something to be done on a horse, Beatty has done it. He now enjoys the theory of natural horsemanship in working with animals, which is how he developed the Colt Starting Challenge for competition. The theory is being put to work nationwide. It has been a powerful tool for the competitors in their own promotion. “For anybody that does this, our goal is to promote how we go about it,” Mundy said. “I like colt starting because I like being able to start horses and get them a good foundation. The first few days with a horse makes all the difference in a horse. That is a key factor in what Beatty has developed. The challenges are a comradery-based system, because all the competitors are after the same goal; they just go about it in different ways. 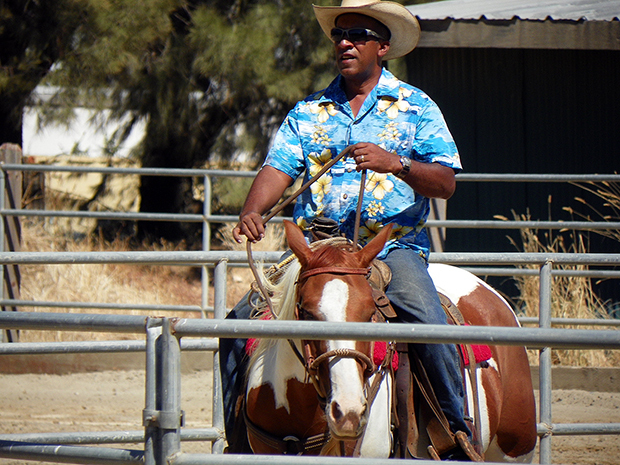 A major ingredient is natural horsemanship, which uses a horse’s instincts and methods of communication. Horses don’t learn through fear or pain; instead they learn from pressure and the release of pressure. In fact, the growth has allowed Beatty to create a Colt Starting Challenge USA finals, which will take place during the Wrangler National Finals Rodeo Fan Fest in December in Las Vegas. The finale also is an attractive enticement for trainers to be part of the challenges. It’s happening Aug. 1-2 in Cortez.